A micro-expression is the natural result of a voluntary or involuntary emotional response to stimuli. Microexpressions occur when the amygdala is the emotional center of the brain and responds to the stimuli felt by the individual and that the last wishes to hide this specific emotion. Are the facial expressions universal? The subject has been studied for some time with some depth about whether the basic facial expressions of emotions are universal or culturally distinct. Charles Darwin wrote in 1872, “The expression of emotions in man and animals”; Expert in Visual Intelligence accept that facial expressions of emotions are universal and biologically determined. 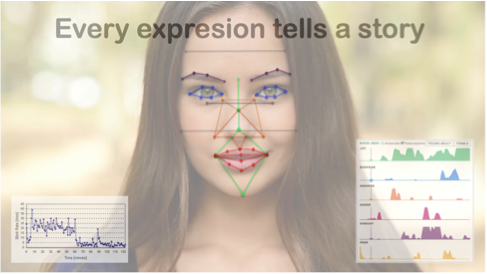 The Facial Action Coding System is also known as “FACS” is used to detect the expression of an individual’s face. The process locates and identifies the muscles that produce the facial expressions. The Unit of Action (AU) was developed to calculate muscle movements. FACS measures the contraction or relaxation of each of the 49 points of control in the individual face and assigns a unit. Multiple muscles can be grouped into one Action Unit and are divided into separate units of action. 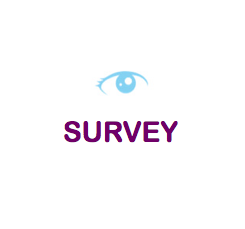 The data measures intensity, duration, and asymmetry. In the graphs that we show in the interpretation module of each question, you can appreciate the strength of each emotion and its length, to correlate it with the question and its answer. Results in a false emotional reaction. Human emotions are an unconscious bio-psycho-social reaction derived from the amygdala and usually last from 0.4 to 3.5 seconds, although a micro-expression on average lasts half a second. Perfectly regular facial expressions, it is virtually impossible to mask the micro-expression reactions. 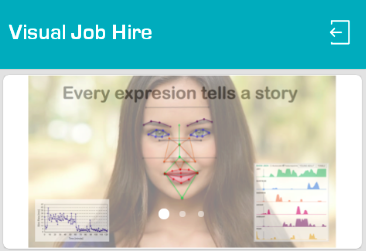 Micro-expressions are very difficult to control because they occur in a fraction of a second, in the Diagnose module we capture someone’s expressions with a smartphone camera and extract Emotions every 4/100 of a second. The micro-expressions express the six universal emotions: disgust, anger, fear, sadness, happiness, and surprise. A video recording of 30 seconds generates around 29 million data records that create Emotions percentages and graphs for each question. Micro-expressions are usually classified according to how an expression is modified. Simulated expressions: when a micro-expression is not accompanied by real emotion. It is the most studied form of micro-expression because of its nature. Simulated occurs when there is a brief flash of expression, then returns to a neutral state. Neutralized Expressions: When an authentic expression is removed, and the face remains neutral. This type of micro-expression is not observable because of its successful suppression by a person. Hidden Expressions: When a falsified expression entirely hides an authentic feeling. Secret expressions are micro-expressions intended to be protected, either unconsciously or consciously. Emotions differ from Moods in that the feelings involved the last shorter. A sense of anger that only lasts a few minutes call emotion. But if the person is angry all day, then it’s a mood. People describe this as an irritable person or an angry person. Some people are born of with their expressions (like pathological liars), while others are formed, for example, actors. “Natural liars” know their ability to control micro-expressions, as well as those who know them well. They get away with it, deceiving their parents, their teachers and their friends whenever they want. Only 3 to 5% of people can simulate emotional expressions by trying to create the impression that they feel an emotion when they do not feel it at all. A person may display an expression that is scary when, in reality, they feel nothing, or perhaps another emotion. The facial expressions of emotion of a person may be controlled for seconds for different reasons, whether cultural or social conventions. There are more personal viewing rules, but the product of the idiosyncrasy of a particular family. The child learn never to look angry at his father or to show sadness when he is disappointed or sad. These visualization rules, which are culturally shared by people, are usually so well pass from generation to generation and so early that the concept of self-esteem dictates the control of facial expression. If a person decides to cheat someone, they will experience that autonomic nervous system. Generates a stress response within the possible consequences if detected. A person who uses deception will usually deal with nonverbal cues that take the form of bodily movements. These body movements occur due to cortisol, which occurs at a higher rate in a situation where there is something at stake. The purpose of these involuntary non-verbal cues is to facilitate in a stressful situation. In the midst of cheating an individual, the tactic of detecting deception, microexpressions do not reveal what intentions or thoughts cheat is to try to hide. The Interpretation module only provides the fact that there was an emotional excitement in the context of the question an the response. If an individual shows fear or surprise in the form of microexpression, it does not mean that the individual is hiding information that is relevant to the session. This is similar to how polygraphs work to a certain extent: because there is a sympathetic response to the fear of being unbelievers as innocent. The same happens with microexpressions when there is no doubt about it. Cheating Detector APP analyzes Self-record videos to determine related emotions. Or it is the act of withholding information or telling false information. If it is successful, it can be followed by expressions of malicious emotions, express in the satisfaction of the deceiver, or blame for the deception, which can lead to an expression of sadness or fear. There is also behavioral signs of false expressions when an emotional feeling is not genuine. They can be interpreted because they are not synchronized, but these signs can not go unnoticed. Sadness: when there is the absence of honest expression of the forehead. Happiness: lack of wrinkles around the eye. Negative emotions: absence of sympathetic somatic response. Any emotion: asymmetric expression, the start of incongruous expression.